The two tempests were designed at the same time, for vastly different spaces and with very different concepts. 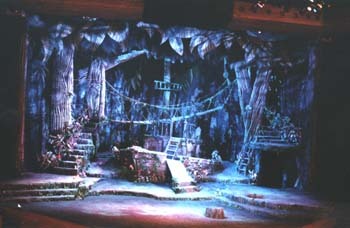 In this production, done in a very large proscenium theatre, the environment was a jungle, in a style of heightened realism, reflecting the magic of the environment. It was very overgrown, with a tremendous amount of artificial foliage. The suspended bridge was practical.